Stay at One of the Best Biloxi, MS Hotels With 26 miles of white-sand beaches and 12 exciting casinos, Mississippi's Gulf Coast is full of adventure. Enjoy our clean comfortable refreshed guest rooms and the free hot Express Start Breakfast Bar, the Holiday Inn Express Biloxi hotel is the perfect choice for your family vacation or business trip. A scenic coastline is just one of the many exciting sites to visit in Biloxi, MS. Our hotel is a short drive from all the casinos, including Beau Rivage, which features more than 2,100 slot machines. Let your kids explore the hands-on displays at Lynn Meadows Discovery Center. Visiting or working at Keesler Air Force Base, we are just minutes away. The sparkling Gulf of Mexico is a must-see on your trip, and we're just across the street from the water on the Gulf Shore. When you stay at our Biloxi, MS hotel, you have all the tools necessary for a productive business trip. Besides an incredible location, we also provide a Business Center and free Wi-Fi access. Looking for hotels in Biloxi, Mississippi to host your next meeting? We have a convenient conference room that can seat up to 20! We want to ensure you have a memorable trip to the Gulf Coast, so we offer all the conveniences you've come to expect. Relax in our outdoor pool, enjoy local favorite restaurants just foot steps away! 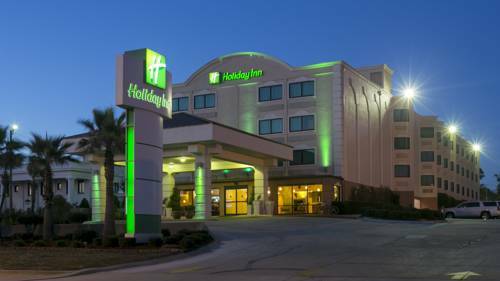 Stay in Biloxi, Mississippi at the Holiday Inn Express Biloxi hotel for a great Gulf Coast excursion! The looks you crave can be found at Edgewater Mall. Stand out in fabulous style with fashions from their four great department stores including Dillard?s, Belk, JCPenney and Sears plus more than 90 specialty stores, restaurants in the food court. Shopping center that features around 57 stores like Target, Bestbuy, Kohl's, Kirkland's, Marshall's, Petsmart, Office Depot, and more!